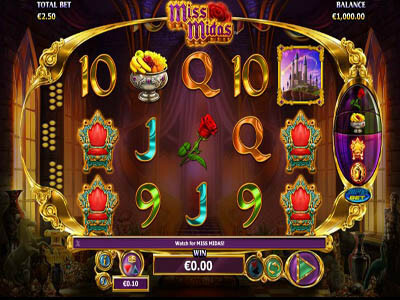 Miss Midas is one of the wonderful Online Casinos Slots that are powered by NYX gaming and can be enjoyed right here on this website for free. The game has 5 reels and boasts a total of 25 paylines. These paylines give players plenty of rewarding whenever players manage to form a winning combo on them. Placing the bets on them is also pretty easy as player will just need to go through the wagering options under the reels. The game takes players on a greatly rewarding and an exciting Greek Mythology themed experience that comes with plenty of special features. For example, there is the super Bet Feature, Free Games, wild symbol, and a scatter symbol that can give out scatter rewards for lucky players.